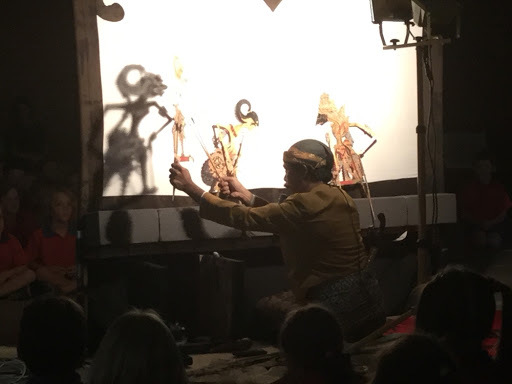 At the end of last term we had a fabulous incursion of a puppeteer from Indonesia. The children from yr 3 up watched the performance from in front and behind the screen. The play was in two parts with the audience divided in front or behind the screen. At intermission the children swapped sides which meant the whole group got to watch the puppet play as it would ordinarily be seen but also they were able to observe how the puppeteer manipulated the puppets. It was very interesting. 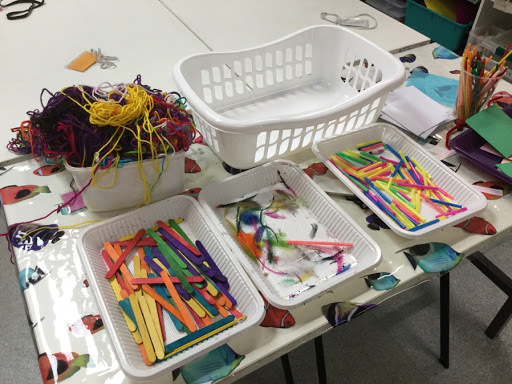 It has inspired this terms activities in our art studio. Ibu Dee and myself have put our heads together and our programmes will support each other. 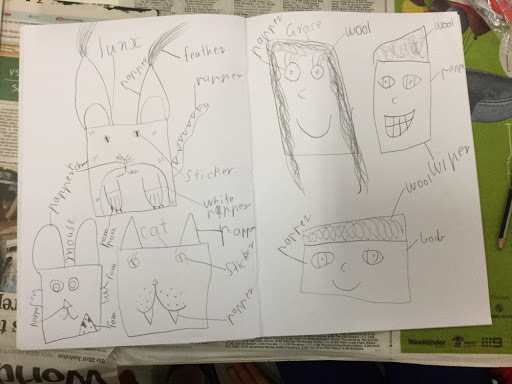 In art we will be making puppets that will be used for plays using Indonesian language in their LOTE sessions. I will also be using them to develop character traits for the writing I do here in the art room. 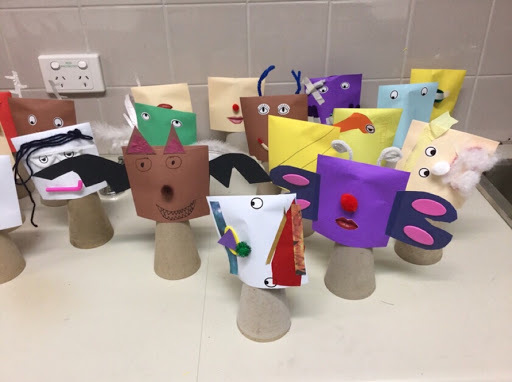 To make these cute little puppets using long envelopes cut in half the children had to start by looking at the materials available. Then they made a plan making sure they labled the materials they would be using. 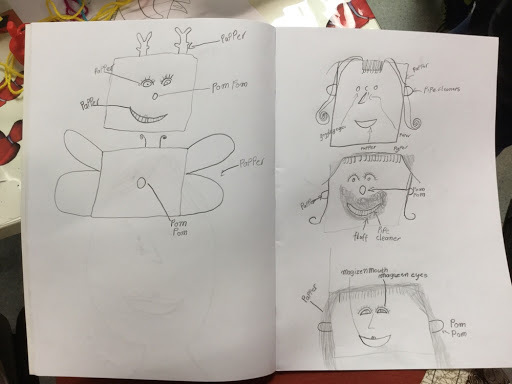 PP children were not required to do the labelling but I encouraged them to plan - thinking about the shapes they might use to make ears or eyes and which materials might be best for hair etc. The older children brainstormed ways they could change a simple piece of paper to be used on their puppet. Here's some ideas they had. We also though about what type of glue would be best to use. 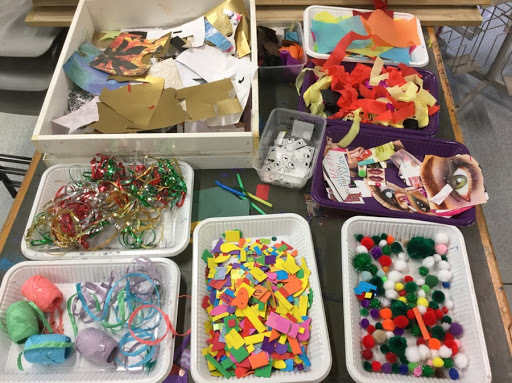 Most of the things could be attached with our glue sticks but some things would require something stronger like PVA or craft glue. We decided to go with PVA because it is strong, clear, good with feathers and pop sticks but it is a little bit supple and things won't snap off when the puppet is being moved about which is what can happen when you use hot glue guns.Each desk has a plate with a little bit of glue and card spreaders within easy reach, these can be topped up as needed but means that it doesn't dry out and get wasted. 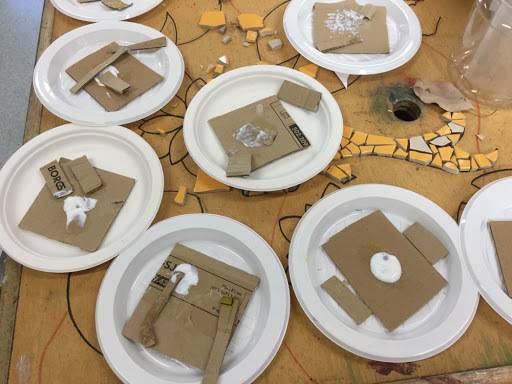 Once they had made their plan they collected the materials they needed and production began! Here are some that the yr 2/3 class have made a start on today. 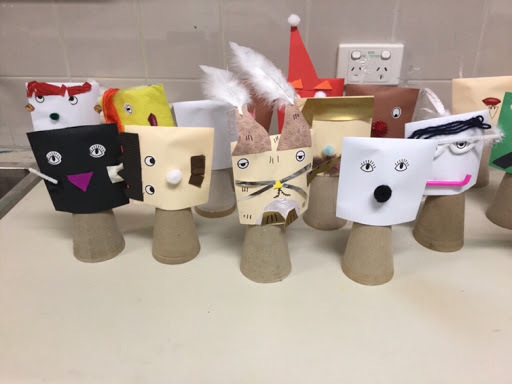 The children have used a brown paper bag we have glued in the back of their visual diary to stash any bits and bobs they are using to finish off their puppets next week.